Due to the sliding nature of the keyboard, the Smartphone Experts Snap On Case for Palm Pre comes in two pieces that snap into place on the Pre. It’s constructed of hard plastic and it’s relatively sturdy. The two pieces, while bendable, seem as though they would be difficult to snap in two. This is important should you drop your Pre, I don’t get the feeling this particular case would shatter into pieces. Just finished our review of the Seidio InnoCase Surface for the Palm Pre, so now we’re giving it away to one lucky member. 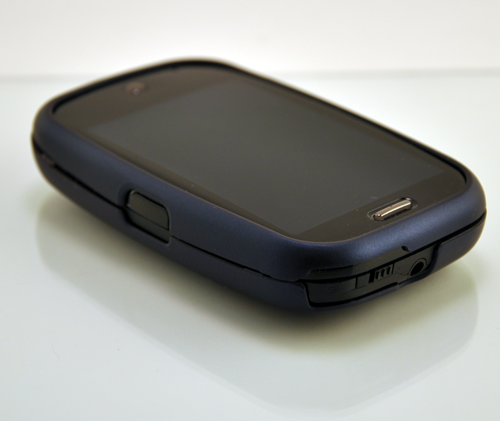 To enter, simply let us know what you like best about the Palm Pre in the contest thread in our Palm Pre forums. Not a member, register today for free. Contest ends on September 23rd and we’ll randomly select one winner from the entries. 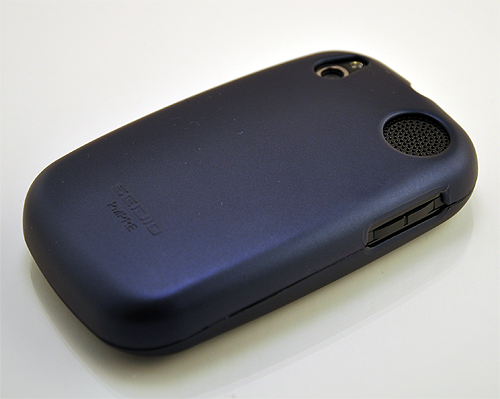 Winner will receive the blue Seidio InnoCase used in our review. Must be a US resident to enter. Please no duplicate accounts — we do check. Posts must be made in the forums to be eligible. Comments will not be published on this article and are not eligible for entry. Now that the Palm Pre has been out for a few months, more and more cases are becoming available for the device. The slider form factor represents a challenge not only for case manufacturers, but for Palm Pre owners looking to protect their phone. The folks at Seidio took on the challenge with their InnoCase Surface for Palm Pre. The InnoCase from Seidio doesn’t ship with any fancy packaging, outside an insert with directions on how to install the InnoCase Surface on the Palm Pre. Truth be told, I rarely if ever read directions first, especially when dealing with a case. However, for the purpose of this review, I glanced over the directions after using the InnoCase for some time. What I thought was simply package filler, was what Seidio terms a “spacer”. I don’t see the need for a spacer, but this is more than likely a scratch preventer. 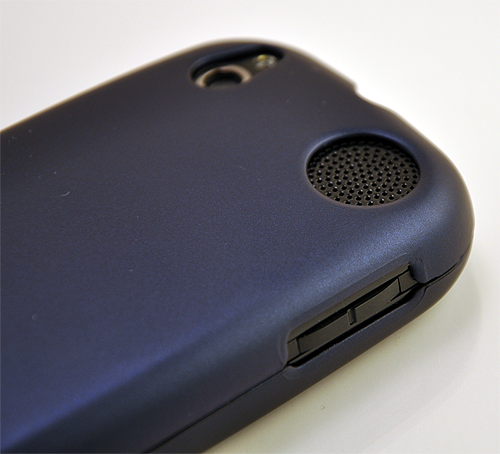 With the “spacer” in place, you should note that the Seidio InnoCase will not work with the Touchstone charger. Installation is easy enough. Slide open the Palm Pre and the pieces will snap into place. All major ports are accessible with the case installed. If you’ll note the sides of the case, it almost appears as if they should attach. Of course, reality sets in that if they attached, you wouldn’t be able to open your phone. Still, it does make the case appear as if it doesn’t fit correctly. In actuality, I was very pleased with the fit of the InnoCase Surface. There aren’t any noticeable gaps between the screen the Pre itself. Additionally, the InnoCase felt secure on the Pre, with no wiggle at all. I tend to open the slider by pressing on the side of the screen and other thumb on the bottom left by the microphone. Both are pressing on the case. I didn’t experience any issues with the case becoming loose or detaching. From the point it was snapped on, the InnoCase Surface stayed in place. This particular case comes in a variety of colors. You’ll notice Blue was used for this review. The case does not add much bulk to the Pre and definitely nothing that most would notice. 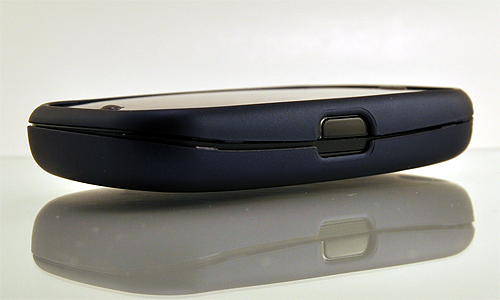 The slim form factor is retained and you have the added comfort of protecting your Palm Pre. The case doesn’t include any sort of protection for the screen, something that I would recommend if moving from a case that doesn’t protect the screen. The case has a rubberized finish that feels good in the hand. Definitely easier to get a grip on the Palm Pre with the InnoCase Surface. While I didn’t deliberately attempt to scratch the case, I would guess that it’s not very susceptible to scratches due to the rubberized nature of the material used. That being said, put this in a pocket with keys and you’re not going to be happy with the end result. The company has the logo embossed on the back, which is acceptable. The product code seems to take away from the look of the case and seems unnecessary. Couldn’t they have put this on the interior of the case? This case comes with options. Seidio offers a holster that is sized for the Palm Pre with the InnoCase Surface. As I noted before, the case isn’t very thick, but the manufacturer’s holster accommodates for the case. While the two part equation is great for business professionals who want quick access, while protecting their investment, it would make sense to offer up a screen protector. Conclusion: The Seidio InnoCase is a solid option for those looking for a form fitting case that offers protection against scratches while retaining the thin design and good looks of the Palm Pre. 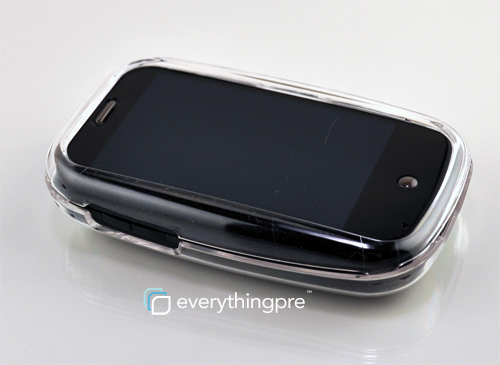 The Seidio InnoCase retails for $29.95 and is available at the Everything Pre Store.